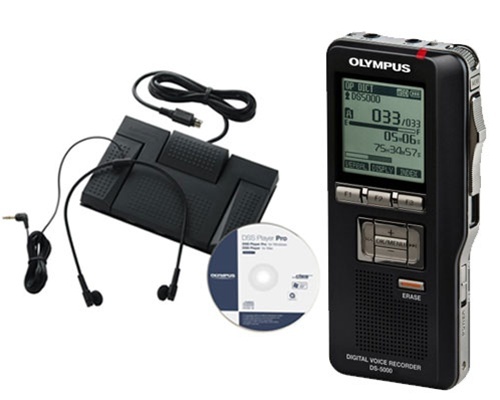 The DS-5000DT Kit is an advanced professional Digital Dictation recorder and Transcription kit. The audio recorder is stacked with premium features and enhanced DSS Player Pro Dictation software for outstanding performance. It's designed inside and out to provide you with all the conveniences you need for easy, flexible and productive dictation. The transcription kit provide a complete, end-to-end business solution. Complete with footswitch, headset, and powerful software, it can easily be integrated into the workflow of any office system and significantly streamline data sharing and distribution of dictations between professionals, departments, and office locations. Special email and FTP functions enable dictation files to be automatically routed to predetermined locations or addresses upon downloading. Citrix and Terminal Service are fully supported. The new features, such as Audio capture function and automatic software upgrade via internet, in the new DSS Player Pro Release 5 improves the usability of the software. Slide Switch Operation provides a quiet and easy user experience, improved comfort and increased productivity. File/Edit function allows you to easily insert, overwrite, partially erase files. Transcribing time left indicator instead of time commenced.